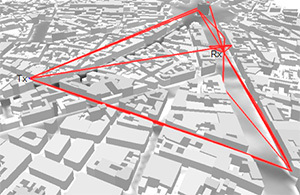 The mobile radio channel in urban scenarios is characterized by multi-path propagation as shown in the figure. Dominant propagation phenomena in these scenarios are the shadowing behind obstacles, the reflection at the walls of buildings, the wave guiding effects (due to multiple reflections) in street canyons, and the diffractions at vertical and horizontal wedges. 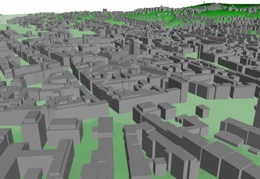 The WinProp propagation models for urban scenarios are based on the evaluation of 3D building data representing the given environment. Possible applications are the cellular or WLAN network planning as well as the planning of radio links (connectivity) for sensor networks. The transmitting antennas can be mounted below the rooftop level or above. 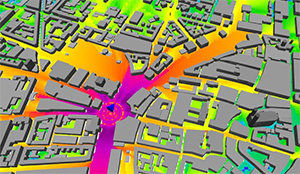 In order to accelerate the time-consuming path determination the Intelligent Ray Tracing (IRT) model can be utilized, which is based on a single pre-processing of the building data. For pure predictions of the radio coverage the urban dominant path model (DPM) can be applied which combines high accuracy with short computation time. More information about the individual propagation models for urban scenarios can be found under the above links. 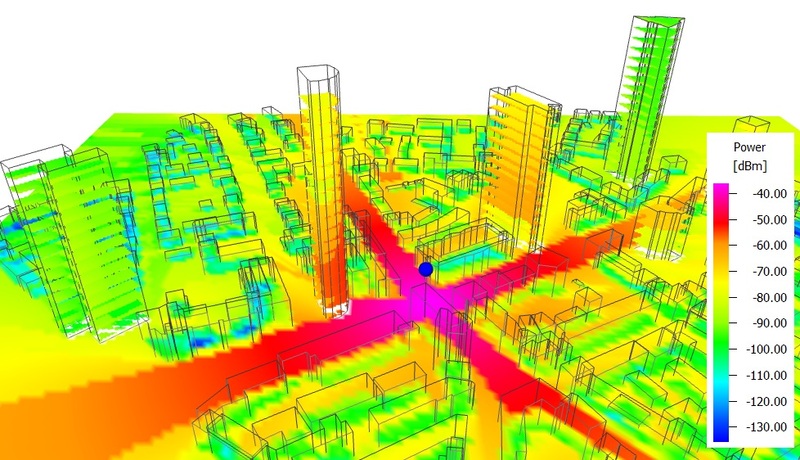 WinProp can use vector databases (either 2.5D or 3D) to describe the buildings in urban scenarios. In the 2.5D case each building is described by a polygonal ground plane and an individual height above street level (polygonal cylinders). Vegetation can be described in the same format. The consideration of topography is possible, if the urban area is not flat. In the 3D case the buildings are described in the indoor database format. This allows a detailed modeling of the rooftops incl. arbitrary oriented walls. But the computation time is also increasing. More information concerning the urban databases (incl. format and specifications for different converters) can be found on the urban database page. coverage and signal levels inside the buildings.